Episode 327: Why you’re already a leader, with Stephen Woessner. Good Morning Onward Nation…I’m Stephen Woessner. And before we dive into the business building lessons within today’s solocast…I want to take a few moments to thank you. Recently, we reached two very significant milestones. Neither of which would have been possible without all of the help, support, love, and encouragement we receive from you, Onward Nation — every day. Your feedback is uplifting…your feedback is inspiring…through all of your Facebook comments, Tweets, comments on LinkedIn, and the emails you are so kind enough to send to us — you let us know we are headed in the right direction — or — if we need to make a course correction or two. I want you to know how much all of this means to me and my team. We love it — because — we want to get better — and getting feedback — is our best tool for learning what we need to learn in order to deliver even more value in each episode. And you are helping us do that — so thank you! And we have learned along the way…so much so…that the world is taking notice. 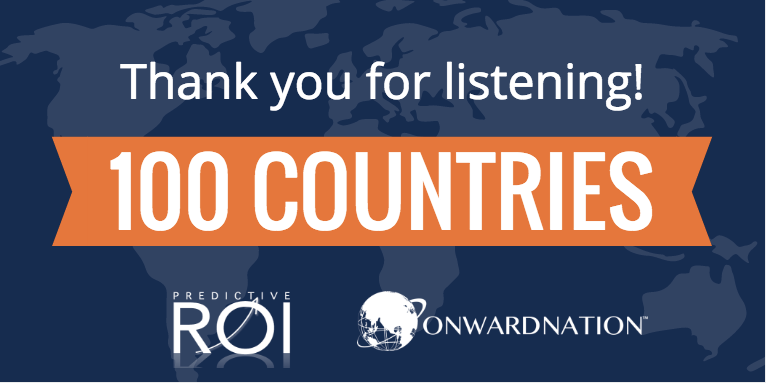 I am proud to say that Onward Nation is now listened to in 102 countries. 102 countries! My word — there are some days — that I need to pinch myself that this has become our reality — that we have this kind of opportunity — to be able to share, talk with, and learn from you, Onward Nation — 102 countries strong — each day. What an incredible gift. Every time you write a review…every time you share a Facebook post, Retweet one of our Tweets, or write a comment on LinkedIn…you are helping us share the powerful lessons from our incredible guests. I want you to know how much I appreciate it. I want you to know sincerely grateful I am for all of your support. To be able to reach 102 countries is a major accomplishment — and it is because of you — that we have been able to do that. And the second milestone? Well, we just blew past 50,000 downloads! Yes, 50,767 downloads and climbing. Not only have listeners in 102 countries around the world subscribed to Onward Nation — but — we have been able to share the great lessons of our guests with an ever-growing audience within those countries. So thank you, Onward Nation. And please trust me when I say — we are just getting started. Even though this is Episode 327 of Onward Nation…we are truly…just…getting…started. Okay, now let’s shift our attention to several key business building lessons that I believe will help you move onward to that next level. Jodi Flynn, our two time guest on Onward Nation in Episodes 125 and 263…taught me much during our two interviews. In fact, one of the most powerful lessons we covered was during our encore interview was the Imposter Syndrome — and — more importantly — how to defeat it every day. How the Syndrome holds us back every day — how if you let it — you will lose your destiny — you will begin to play too small — it is easy to let that slippery slope of sliding backwards inch by inch rob you of everything so special God has planned for you. But you have to reach for it. You have to commit…you have to lead your team…you have to push the boulder up the hill…and then go back down to the bottom of the hill and get another one…maybe even a larger one…and then push that one up the hill. It’s not all peaches and cream all of the time. Of course not. But that is what leadership is. Sometimes leadership is getting into the trenches — side by side — with your team — looking them right in the eyes — and showing them — telling them — we got this…and we got this together…and then you push the boulder up the hill. And then Jodi invited me to be her guest — on her podcast called — Women Taking the Lead. Brilliant show. And one of the lessons I shared with her audience might even surprise you, Onward Nation. I believe you are already a leader and mentor…whether you want to be or not — whether you accept this responsibility or reject it — either way — you are being a positive influence — or a negative influence. But you are creating influence. So why not create positive influence, right? As you might imagine — given the title of Jodi’s show — we dug deep into a variety of leadership questions — some deeply personal stories, Onward Nation, and how some of the women in my life impacted my career — impacted me as a person — and gave me the confidence to tackle any challenge. I thought the best way for me to share all of these insights would be to air the full interview — Jodi and me — from Women Taking the Lead — aired as part of today’s solocast. And then I will be back to wrap it up at the end with a powerful lesson you can think about as you move through the rest of today — and your week. Okay, Onward Nation…here’s my good friend, Jodi Flynn…from Women Taking the Lead. Before we close out for today — I want to reinforce a point from my interview with Jodi. Is being a leader hard? Of course. Is being a mentor challenging? Absolutely. Is the Imposter Syndrome nipping at your heels — and in your head — every single day — trying to rob you of your destiny? Most definitely. So, Onward Nation…you are capable of so much more — we all are. We are not doing God — our customers — or the world any favors by playing small. In fact, we are cheating our customers, cheating the world, and being disrespectful to God by not applying all of the abundance of talents and gifts we were so richly blessed with. And oftentimes — what is the biggest obstacle in our way? Yep. Ourselves. So, if you want a good laugh today — go to the show notes of this episode and there is a link to a Saturday Night Live skit from many years ago when Bob Newhart was the guest host of the show — it’s hilarious — and the first time I watched it, I laughed so hard, I cried. It will help you put your Imposter Syndrome into its proper place — and you might laugh hard enough to get those endorphins flowing. And please continue to let me know what you think of Onward Nation…good or bad…I always want your feedback. We will be back tomorrow with an incredible encore interview with Peter Strohkorb — you will not want to miss Peter’s philosophy about “If you don’t believe in yourself — why should others?”, Onward Nation. Peter and I dig deep into topics like success, leadership, how to conquer fear and many other powerful lessons. The encore with Peter is off-the-charts amazing, Onward Nation! Don’t miss it.